​​​​​​ HUMBLE – The very first Crystal Lagoon water feature in Texas is opening this month. The two-acre lagoon within the Balmoral community is up to eight feet deep and the size of almost two football fields. 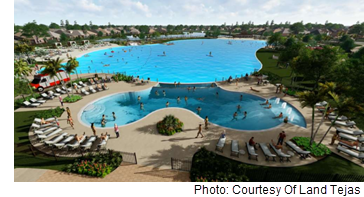 Crystal Lagoon will feature two white sand beaches for swimming, kayaking, canoeing, and stand-up paddle boarding. Balmoral is a 750-acre residential community with 1,700 homes.